Welcome back to Sitevalley blog. This time we will talk about setting up the simplest possible site using one of the most popular Content Management Systems. 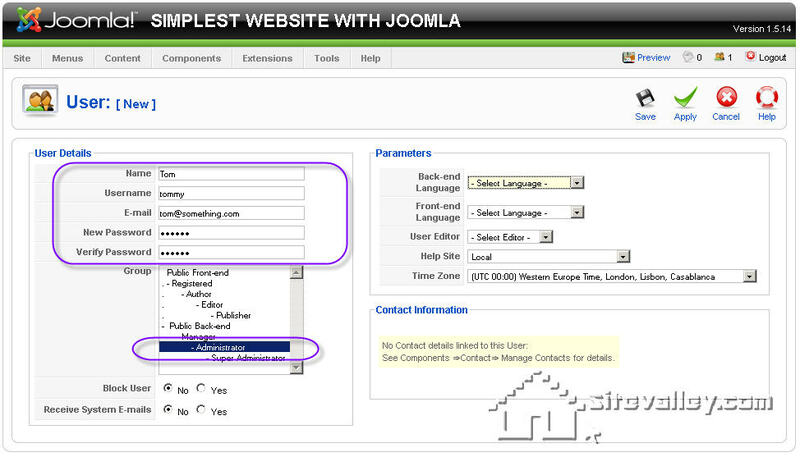 The script we are going to use is ‘Joomla’. 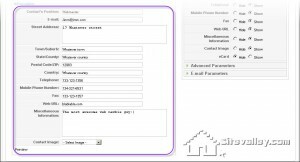 It can be easily installed using the ‘Installtron’ in your DirectAdmin control panel. 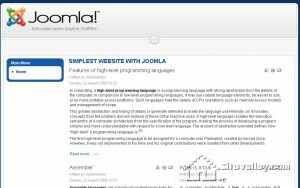 The ‘Joomla’ installation is available on ‘Pro hosting Plan’. All the content data used in this post was taken from Wikipedia.org. There should be 4 sections dedicated to history of computing, hardware, programming languages and computer networking. There should also be a section for the owner of the site that will be dedicated to his personal news and such. The front page will be dedicated for the special stuff. 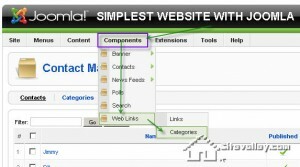 Also sections for links, search page and news feeds dedicated to computers will be included. News feed will be also available on the front page. This tutorial will consist of two posts. The first one (i.e. this one) will show you how to create the content for a site meeting the tasks above very easy and fast. The second post will show how to configure the menus and various modules in order for all of you content to be comfortable accessible from you front page. 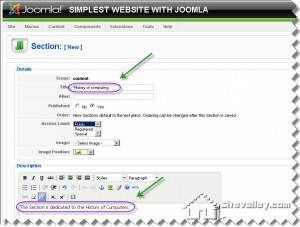 It will also give description of the basic theme’s layout and several instructions where to place what on your site. Generally sections contain numerous categories and the categories contain numerous articles. Now we will create the sections required by our goals. 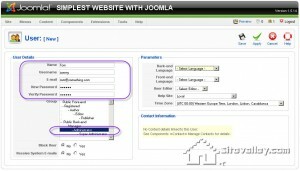 Login into your administrating section of Joomla (default link is http://yourdomain/administrator if you Installed Joomla into the public_html folder of your main domain). Now using the same technique add all other categories we have talked about. 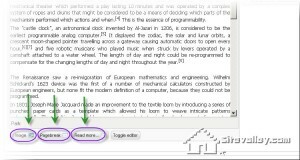 You will be adding or changing titles for the articles, and putting the last into sections and categories. 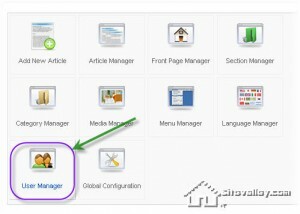 You will be publishing or un-publishing your articles, you will also be able to configure the option to display the article on the front page of your site. 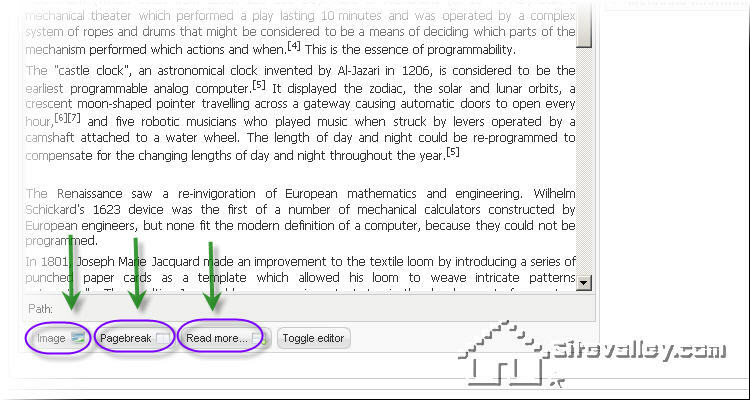 ‘read more’ – let’s you divide the article into two sections: summary and full views. 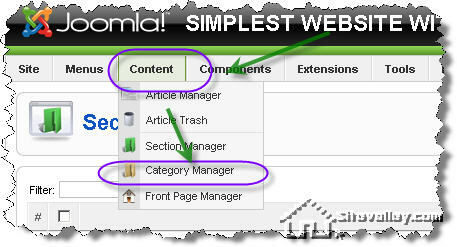 ‘image’ – let’s you add an image using convenient upload form and Joomla’s media manager. When done simply press ‘Save’. The administrators can introduce changes not only to content but to a whole site. We would also want to create a person who will be capable of adding articles to the categories and this will be a ‘Manager’ group representative. 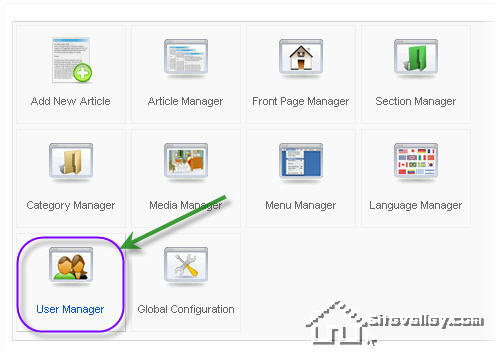 So when creating such user instead of ‘Administrator’ you need to select ‘Manager’ in the ‘Group’ filed. As the World Wide Web is the greatest net of all known to mankind the main brick of it are the weblinks that actually bond resources together. So you would definitely want to have a ‘Weblinks’ section to link to other websites with related resources. 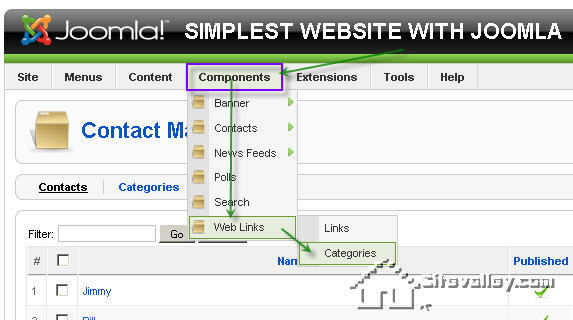 Go to the ‘Components’ menu, there select ‘Web Links’ and then ‘Categories’. In the just opened window press ‘New’ in the top right region of the screen. Here once again click the ’New’ button. Let’s add one link just to see what it looks like. Type ‘The Computer Information Center’ in the ‘Name’ field (this is the name of the web link). In the ‘Category’ field choose the ‘Computer Information’ we have just created. In the ‘URL’ input the link ‘http://www.compinfo-center.com/’ (this is a real link actually). You can add some information to the ‘Description’ section to make it easier for your visitors to find the links they actually need. Now press ‘Save’. The last piece of information we need to add to our content is News Feeds. New feeds are pretty useful as they keep trace of all the latest news and automatically display their titles on your website. 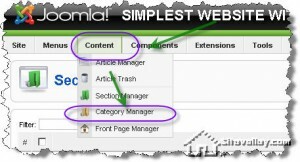 To use the news feeds we would need to let the Joomla know where to take the news from. There are plenty of news feeds available on the net. Here press ‘New’ (by now you already know where to find that button for sureJ). 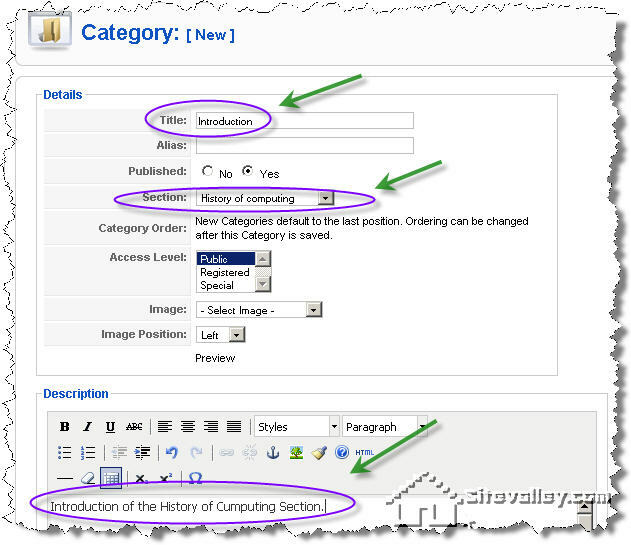 Create the category named ‘Computer Information’. Press ‘Save’. 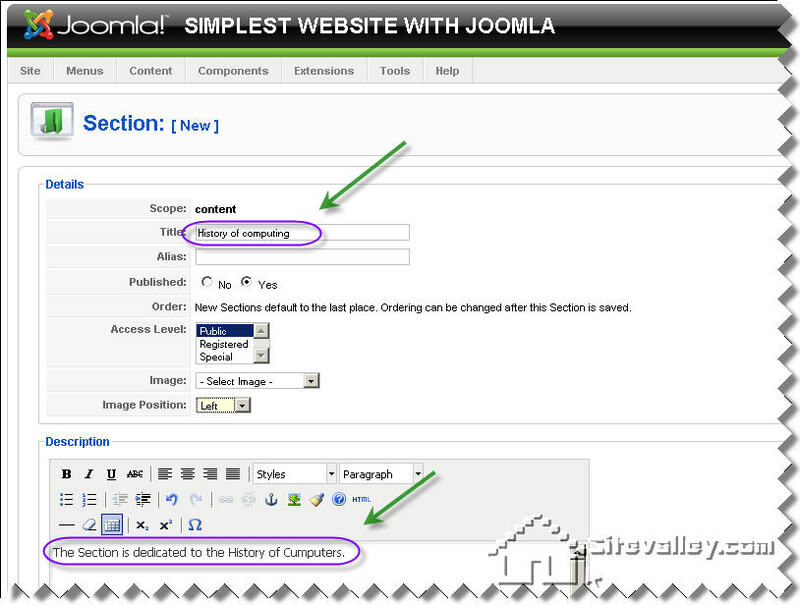 So far in this part of the Tutorial we have covered the creation of content for your website. 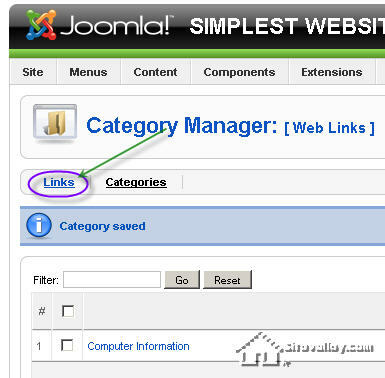 We have created several Categories and Sections and then added articles to them. We have also introduced two additional users (Tom and Bill). 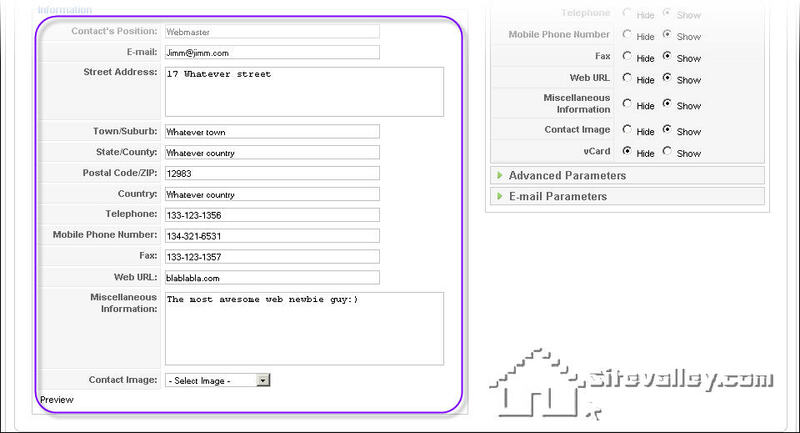 We have added the contact information to every person who will take part in management of the site. To interconnect with other resources on the Internet we have added content for the Web Links section and also added two resources to get the news feeds from. So far all of the above is the content of your website. But the content itself is not too useful if not represented in an appropriate way. Right now most of the content you have created is not available from your front page. 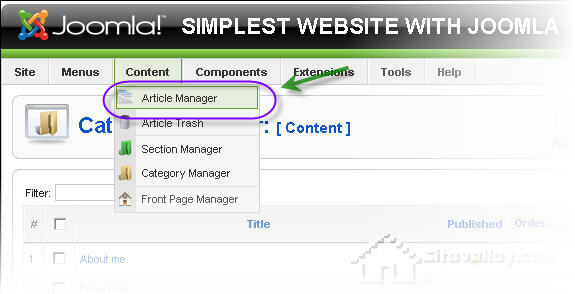 The second part of this tutorial will cover actions required to present the content on your site using Menus . We will also see how to place the various menus exactly where you want them to be placed (simply put – the layout of your website). 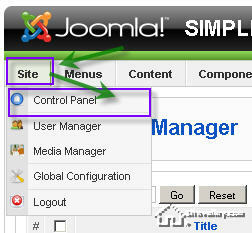 The last but not least we will do is change the Joomla logo to your own.